Our clients enjoyed entertaining friends and family, but their kitchen and other existing spaces weren’t conducive to this hobby. They desired a warm, inviting space for their frequent get-togethers. The home’s back elevation was “cookie cutter” and lacked character. 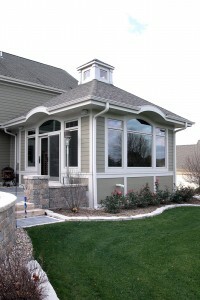 The sunroom addition features a cupola with Azek crown molding and trim, adding charm to the exterior and blending with the existing structure. The exterior also includes fiber cement composite siding for less maintenance and more durability. The sunroom’s interior offers easy access to the kitchen to assist with entertaining. There is a pass-through, and the large archway allows people to flow from one room to the other, making it one useable space. The bar area features Golden Fantasy granite, wood-framed doors with “water glass” inserts, a slate backsplash, a beverage refrigerator, and custom wood wine cubbies. The kitchen and entertaining space originally ended abruptly at the back of the house, so there was little room for guests. The addition has an open concept, conducive to entertaining a group of people. The large windows also showcase the conservancy views, and the patio door connects the space to the outdoors. The hand-framed, vaulted ceiling makes the addition feel more spacious, and the box beams at the hip rafters and cupola draw guests’ attention upward. Rope lighting was incorporated at the crown molding and cupola to highlight the unique ceiling. 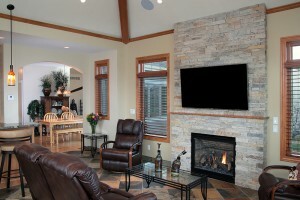 The fireplace is a focal point, giving the room a cozy feel. It features hand-cut Lannon stone that ties the addition into the home’s exterior. The dynamic slate floor also uses hydronic heating, so the homeowners can comfortably enjoy the space in the winter (even without socks). This entry was posted in Projects and tagged Bar, Beam Ceiling, Custom Cabinetry, Delafield Remodeler, Entertaining, Entertaining Bar, Entertaining Space, Exerior, Exterior Remodel, Granite, Granite Countertops, Home Addition, Home Bar, Home Improvement, Milwaukee Remodeler, Patio Door, Slate, Slate Backsplash, Southeastern Wisconsin Remodeler, Sunroom, Sunroom Addition, Sunroom Patio Door, Vaulted Ceiling, Waukesha Exterior, Waukesha Exterior Remodel, Waukesha Remodel, Waukesha Remodeler, Waukesha Sunroom, Waukesha Sunroom Addition, Wet Bar, Wisconsin Remodeler on July 24, 2014 by amanda.